Different authorities are of differing opinions as to the life span of a blog post. Some say 2.6 Days (source) and some forever. I would learn more on the side of forever, but with the caveat that it must be good evergreen content, and it must be continually updated to last forever. Google’s Quality Rating Guideline v.5, the guide for manual reviewers, specifically states that they expect individual pages to be updated as information changes. This is common sense to some of us, but not others. 2. It serves your readers to do so. Once you've been blogging for a while, it is a great plan to go back through your old content, updating it, making sure it is still relevant to your audience and then republishing it and getting it back out them. Chances are those who followed you 2 years ago, or maybe even 6 months ago have not seen it and would benefit from you sharing it again. 3. It's easier than continually coming up with new content. 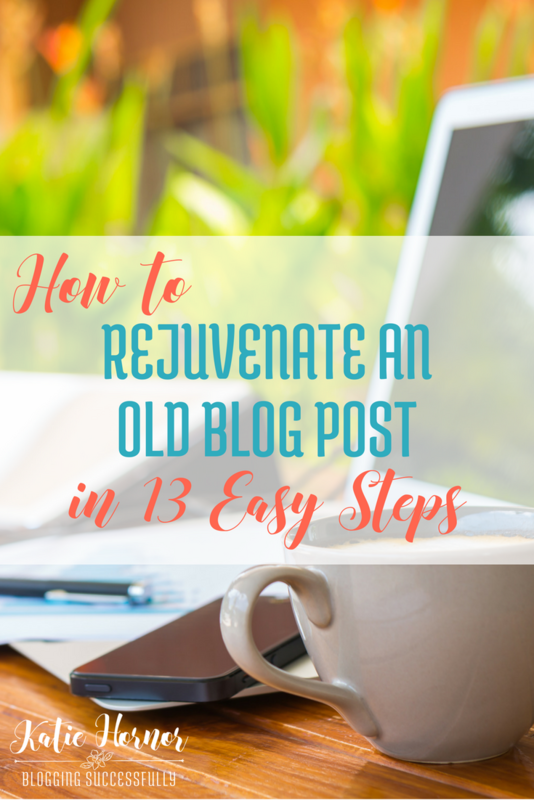 Rejuvenating an old blog post to extend it's lifespan and to serve your readers also indirectly helps you because you don't have to come up with new content all the time. Recycle and refresh some and write some new. It does take some of the content creation load off. Pinnable Image – make sure you have one, and make sure it is consistent with your current logo and fonts. Link the pinnable image to the post it goes with, and be sure the keywords are in the image alt tag and that the description is a good keyword rich description. Featured Image – Be sure the featured image is set to the new updated image. Old Images – If there are old images in the post that don't show up, just delete them. Old Affiliate Links – Check (and update as needed) any affiliate links in the post. New Affiliate Links – Add NEW aff links whenever relevant. My rule of thumb is to aim to include at least 3 affiliate or product links per post. Disclosure Statement – If there are affiliate links be sure to include a disclosure statement (per FTC regulations) and link it to your site's main disclosure page. I usually use an image of text like this in a post prior to the first affiliate link. I use an image simply titled “disclosure” so that if that text get's pulled in a preview when the post is shared it shows jus that word and leaves more room for actual post text instead of taking up the entire preview with disclosure text. Relevant Links – Interlink naturally with other posts if possible. Category – Choose only ONE category per post. If it fits in another choose the primary category for the category and use the secondary categories as tags. Keywords – Choose relevant supporting keywords as tags. Check to be sure your focus keyword still works in your Yoast SEO plugin. Date – **IMPORTANT** If you have the date listed in the URL (permalinks) of your posts, DO NOT CHANGE THE DATE. If you do any previous links you have shared around the internet will be broken. Just update the info by clicking update on the post and share to social media again as an “updated post”. If your URL does not include the date, change the date to the present and hit update to republish it at the new date. 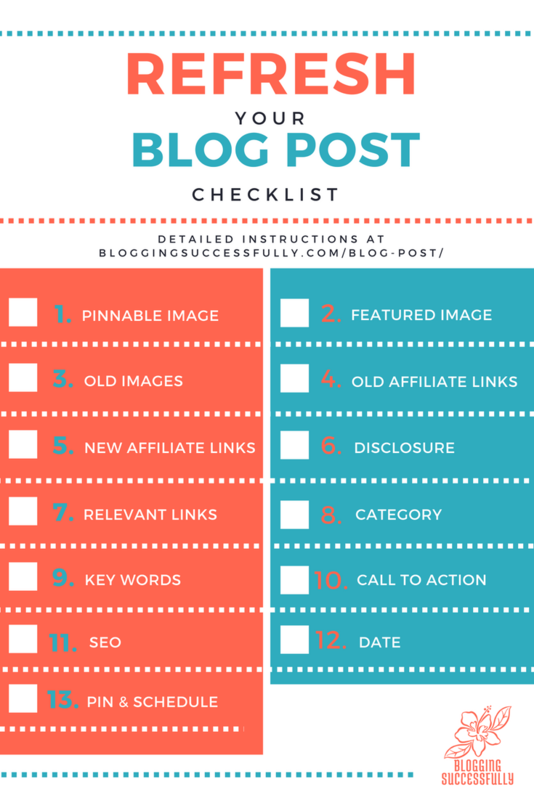 This brings the post back up to the forefront of your blog roll or the top of your blog post page. And you can share it on social media as an updated post. Pin and Schedule- Anytime you update a post, and especially with a new pinnable image, you want to push it back out to Pinterest, and share to Google+. Many overlook Google+ because it does not seem to be a big driver of traffic. In my opinion G+ does more for boosting your authorship authority and SEO rankings than anything, and is worth it to get each new or updated post officially linked to you by posting it there. You also want to get your newly refurbished and shined up content scheduled on Facebook and Twitter, so that your current followers have the chance to see it and benefit from it. And, if your post happens to be an expired sale or giveaway post, consider reworking it into an evergreen review post of that product/service instead, refresh it, add your affiliate links and push it back out to your people. A blog post takes time and effort, and in some cases, blood, sweat and tears. It should not die in the archives after 2-3 days of fame. Keep your content fresh and you will do a great service both to yourself and to your readers. Want this checklist in downloadable form? Click the image to open the download in a new window. The 13 point checklist is nice, too. Keep up the great work! Thanks for taking time to check us out Len! Appreciate it.